For those of you new to Manga Monday or don't really remember when I started this last year, Manga Monday is a blog feature that exists alongside Book to Movie Monday where I talk about Anime, Manga's, Graphic Novels and Comics. This feature will sort of be a catch all for all of the above. Some weeks I might just showcase a title, others I might talk about an artist or even (least here's hoping) feature an interview or two. We'll just sort of roll with the punches together. Sound good? I think so! This week I'll be talking about popular dramas that started off as manga. Some of these you might already know or have even watched yourself, others might surprise you. First up is Playful Kiss. This Drama is based on the Japanese manga Itazura Na Kiss written by Tada Kaoru. 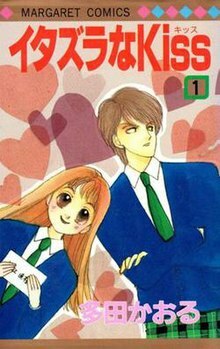 Over the years the manga series has had 4 adaptations (that I know of) The taiwanese based It Started With a Kiss (2005) and the sequel They Kiss Again (2007) the Korean based Playful Kiss (2010) which is the one I've seen and followed and Mischievous Kiss Live in Tokyo (2013) a Japanese Drama. Playful Kiss (2010) stars Jung So-min (Oh Ha-Ni) as a clumsy girl who has a hopeless crush on popular and genius male student, Baek Seung-jo (played by Kim Hyun-joong). After being brutally rejected by Baek Seung-Jo, Oh Ha-Ni is crushed. However, like many dramas, fate has other plans. Comedy ensues as their relationship grows and they realize how perfect they actually are for one another. You can watch Playful Kiss on Drama Fever by clicking here. Next up is To The Beautiful You. This Drama is based off the manga Hana-Kimi (For you in full blossom) written by Hisaya Nakajo. This manga series has had a slew of adaptations starting with the Taiwanese adaptation Hanazakarino Kimitachihe (2006), the Japanese adaptations Hanazakari no Kimitachi e (2007) and Hanazakari no Kimitachi e (2011) and lastly the Korean version To The Beautiful You (2012). To The Beautiful You (2012) stars Choi Sulli as Goo Jae-hee a Korean girl living abroad in the US. One day, she sees a track and field competition on TV, and becomes attracted to one of the high jump competitors, Kang Tae-joon played by Choi Minho. Goo Jae-hee starts to obsess over Kang Tae-joon but realizes she will never be able to get close to him since he attends an all male High School. Undeterred she disguises herself as a boy and enrolls in his High School. However, to her dismay he despises her. Eventually though secrets are revealed and feelings begin to develop and a love story ensues. You can watch this series on Hulu by clicking here or on Drama Fever by clicking here. Fun Fact: SM Entertainment bought the rights to the series. Shinee's Minho and f(x)'s Sulli were cast in the leads roles respectively. Next we have City Hunter. This drama is based on the serialized manga City Hunter written and illustrated by Tsukasa Hojo. Unlike the others listed above this manga has spawned several anime adaptations and a Movie starring Jackie Chan! City Hunter (2011) stars Lee Min-ho as characters Lee Yoon-sung/Poochai. Using the identity of a Korean-American teenager, he assumes a double life by graduating from MIT with a doctorate degree and lands a job at South Korea's presidential palace. His ultimate goal is to avenge his father's death. This is a highly complex series about espionage and love and is definitely worth a watch. You can watch this series on Drama Fever by clicking here or on Hulu by clicking here. Last up is probably the most recognized one on this list. You guessed it, Boys Over Flowers. This drama is based on the manga Hana Yori Dango written and illustrated by Yoko Kamio. As of 2015 this manga has produced 1 anime, 7 television adaptations and 8 films and a sequel Boys Over Flowers 2. Yup too say this one is popular is an understatement. Boys Over Flowers (2009) stars Ku Hye-sun as Geum Jan-di the daughter of a local dry cleaner who lands herself a scholarship to Shinhwa High School after saving a bullied student from committing suicide. Geum Jan-di finds her shallow, privileged classmates unbearable, especially the notorious F4. Rich, handsome, and arrogant, Gu Jun Pyo (Lee Min-ho), Yoon Ji Hoo (Kim Hyun-joong), So Yi Jung (Kim Bum), and Song Woo Bin (Kim Joon) are the kings of the school and no one except for the proud and headstrong Jan-di dares to challenge them. Gu Jun-pyo is the leader of F4 and takes great delight in tormenting Jan-di after she stands up to his bullying ways, but eventually ends up falling madly in love with her much to the dismay of his family. 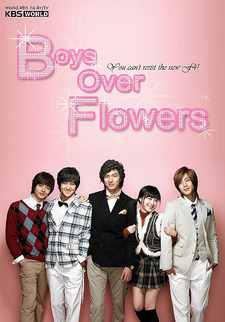 You can watch Boys Over Flowers on Hulu by clicking here or on Drama Fever by clicking here. Fun Fact: Depending on the version you watch (or read) the reason the Jan-di character ends up at the High School is completely different. In the manga it's so she can find a rich guy to eventually marry, in the Japanese tv series it's because she idolizes internationally renowned model Todou Shizuka who was an alumni of the school and of course in the Korean version it's because she saves someones life while delivering laundry to the school. Which adaptations did I miss?